This Culpeper type microscope is unsigned and dates within the first quarter of the 19th century. Microscopes such as this are derived from the instruments of the earlier century made by Edmund Culpeper (1670-1737) and his contemporaries. 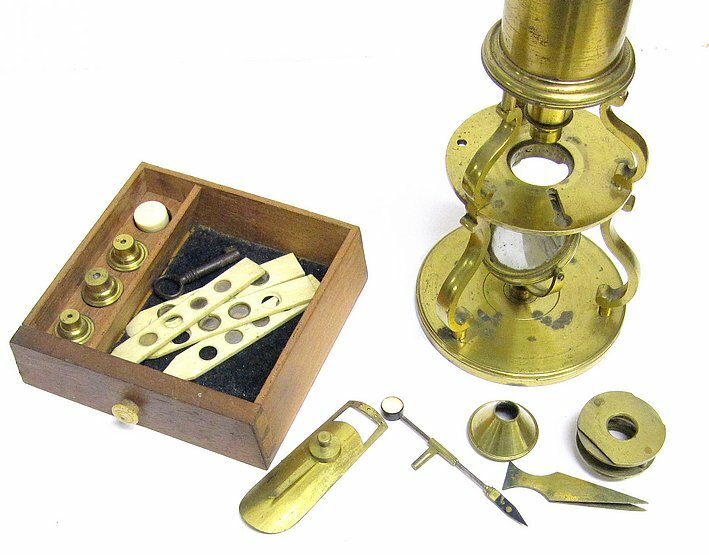 These small brass Culpeper style microscopes are relatively common. They were made for the trade and consequently, they are often not marked by the retailer or maker. The microscope is stored in a pyramidal shaped case with lock and key and is mounted on a round brass base that supports three scrolled legs that in turn support the stage. The mirror is attached on a boss in the base. The circular stage has a central aperture for illumination by transmitted light. Three additional scrolled supports rise from the stage to carry the main tube. Focusing is achieved by rack and pinion moving the body tube. The optics consist of a double eye-lens and field lens within the body. The objectives are not achromatic. Among the surviving accessories, which are stored in a lower draw of the case, are four numbered objectives, a stage forceps, a hand forceps, a sub-stage light cone, a Bonnani spring stage, an ivory talc box, a fish plate, and a collection of four ivory sliders each containing multiple specimens.